But will the Registry offer relationship registration ceremonies? It appears not. The Registry website menu offers a link for ‘registry marriages’ but no similar one for relationship registration. People who want to get married have to fork out $225 (for mid-week marriages) but that price includes a ‘keepsake certifcate‘. I can’t find any pictures of that. I wonder if it comes in eternity and calligraphy models? 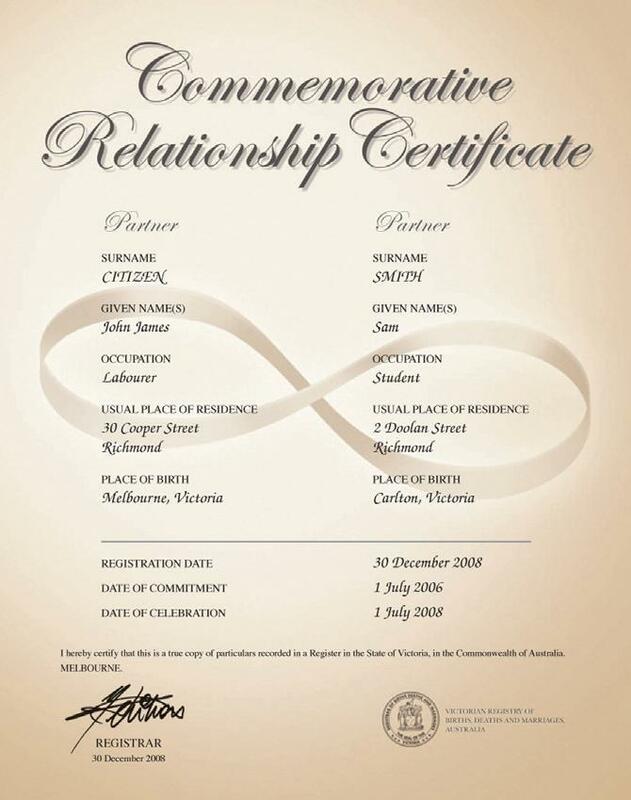 All up, Victorian marriages (with pretty certificate) cost $6 more than Victorian relationship registration (with pretty certificate), but the newlyweds get a ceremony at the Old Treasury for their money, whereas the newly-registereds get to watch someone stamp a form at the Registry office. Does that sound like ‘equal protection of the law without discrimination‘? And the acts of a public authority that are compatible with that right? This entry was posted in s 8: equality, s38: conduct mandate. Bookmark the permalink.